The Kita family is related to Nitta Yoshisada, who was a descendent of the Minamoto clan. 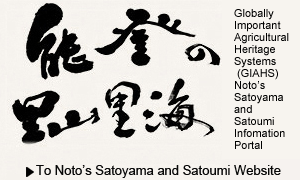 Among Yoshisada’s descendants served the Hatakeyama clan, the governor of Noto. In the early Edo period, the family changed their name to Kita, after settling in Kitakawashiri. The family began to serve as tomura-yaku; they were in charge of controlling farming villages in the Kaga domain in 1819. They rose to the level of head tomura-yaku, and at one time governed as many as 203 villages. Their house can be traced back to the early 19th century. The main building, front gate, equipment storehouse and miso storehouse have been designated as important cultural properties by the national government. The main building, with its pantile gable roof and entrance on the gable side, is built on ground that is about 1.5 m lower than the surrounding land to prevent it from being seen from the outside. It looks like it is in the mortar. The house has 16 rooms, including a gathering room for listening to farmers’ petitions and complaints, a room used exclusively by the lord of the domain, and a three-tatami-mat room where warriors who guarded the lord could hide and stand by in case they were needed. The hall of the house is 1.5 ken (about 2.7 m) wide, so that spears thrust from outside could not reach the rooms inside. When the 13th lord of the Kaga domain, Maeda Nariyasu, made his rounds of Noto in 1853, this residence was used as the official inn for him.